A session is a group of user interactions with your application that takes place within a given time frame. a single session can contain multiple screen views. You can think of a session as the container for the actions a user takes on your site. Sessions can occur on the same day, or over several days, weeks, or months. As soon as one session ends, there is then an opportunity to start a new session. By default, a session lasts until there are 30 minutes of inactivity. When a user arrives on your site, Analytics starts counting at that moment. If 30 minutes pass without any interaction, the session ends. Analytics resets the expiration time by adding on an additional 30 minutes from the time of that interaction. In this scenario, the first session that was opened when user arrived on the application and. After screen 2, the session expiry is set to 12:07. When he started browsing the application at 12:08 analytics sets a new 30-minute expiry, and a new session begins. 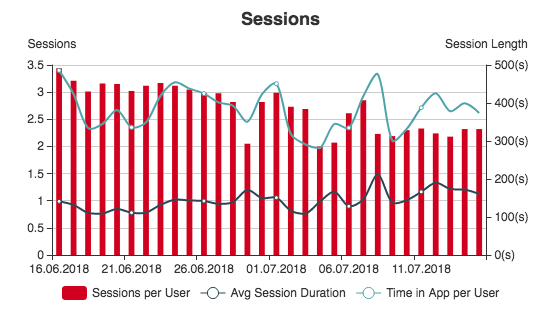 When a user returns, the session that was open continues from the last screen he was viewing on your application as far as Analytics is concerned, he never left your application. The difference this time is that because he returned in under 30 minutes, the old session remains open. The user opens your website at 23:55 on the 11th of February and leaves your website at 00:10 on the 12th of February. The first session ends at 23:59:59 on the 11th of February, and the second session begins at 00:10 on the 12th of February. End of day is determined by your view timezone settings.